I love decorating for Christmas. 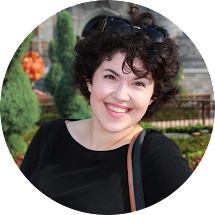 As soon as November rolls around, my fingers start itching to tie up red bows and hang holly around and about everywhere. I hold off until after Thanksgiving to put things up, but long before then I'm browsing Jo Ann's and Target and everywhere else for inspiration. 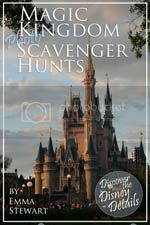 But the number one BEST place to look for inspiration is, unsurprisingly, DISNEY. 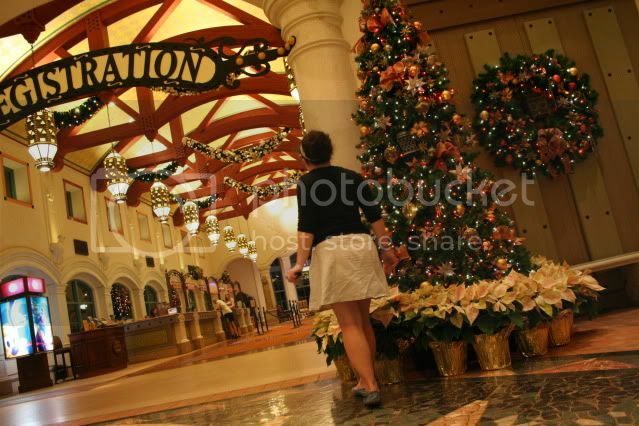 When Disney decorates, they create a fantasy holiday come to life. 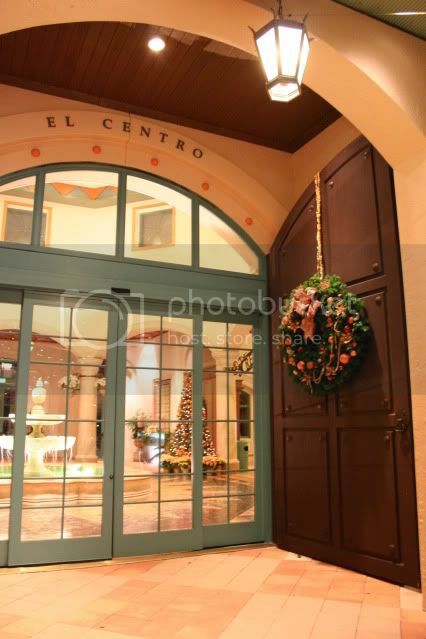 In the lobbies of the resorts or different corners of the parks, you feel like you're celebrating the season in your own mansion, lavishly decorated (and themed of course!). Trees of all sizes abound. 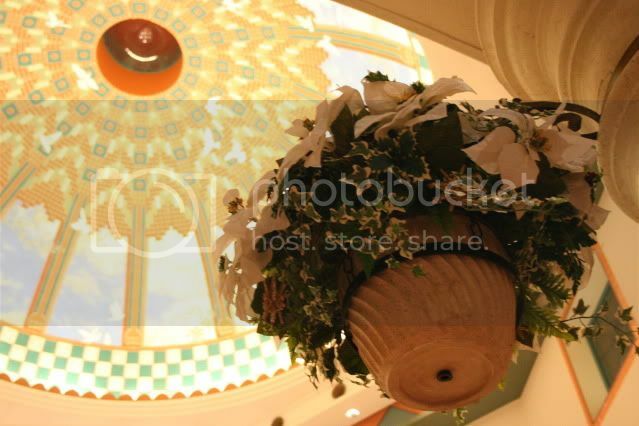 Swags and wreaths overhead are positively bursting with beautiful ornaments, each one so pretty you just want to sit and stare at it for 10 minutes to take in all the detail. Every other step you're tripping over a real poinsettia plant. You're completely immersed in it. 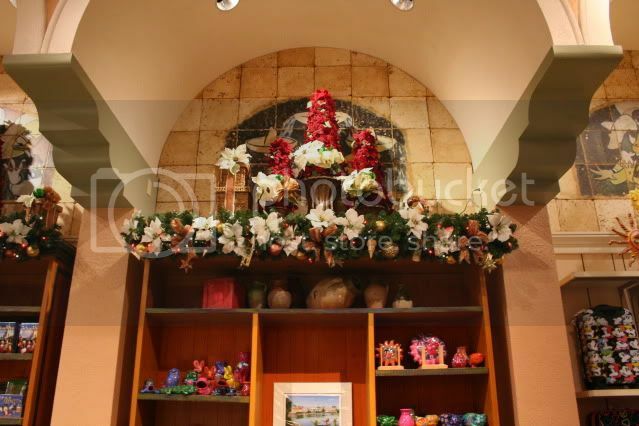 Since I was just posting about a sweet snack at Coronado Springs, I figure we'll head back there to take a look at some of the southwest holiday trimmings! 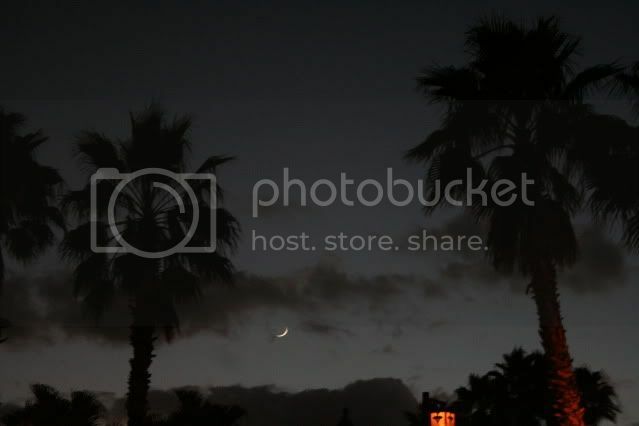 Not a Disney decoration but a natural one -- I loved the way the sickle moon hung over the palm trees as I headed from the parking lot to the lobby! 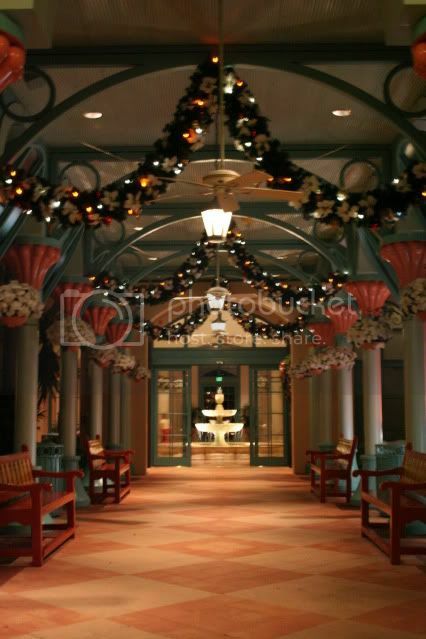 As I approached Coronado's port cochere, there were two things I noticed: tons of white poinsettias, and tons of GOLD. 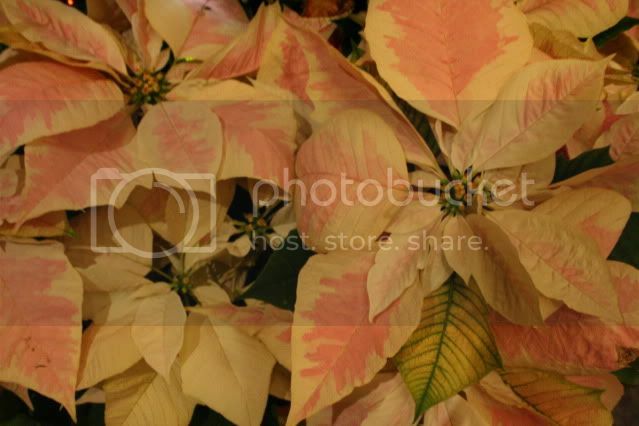 Normally you think RED for poinsettias, but I loved these white ones, the way they're sort-of tinged with pink. Plus they remind me of white snow, which I am sorely missing in Florida. 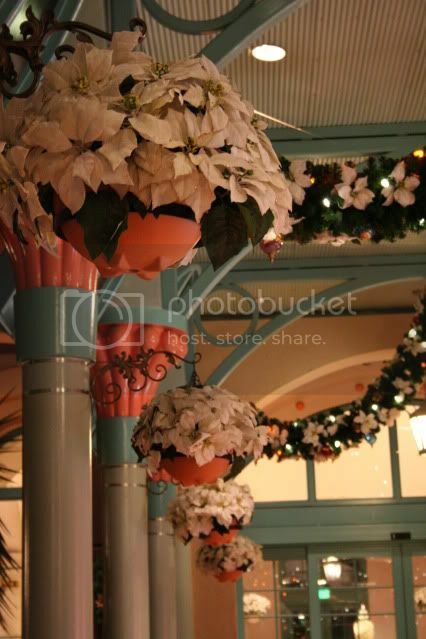 A white poinsettia plant is now defs on my shopping list! See what I meant about all the GOLD?? 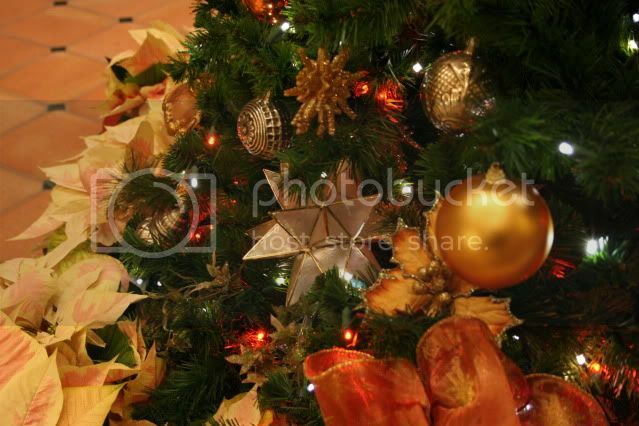 Gold-tipped flowers, warm amber and rust and gold tones for the ornaments. 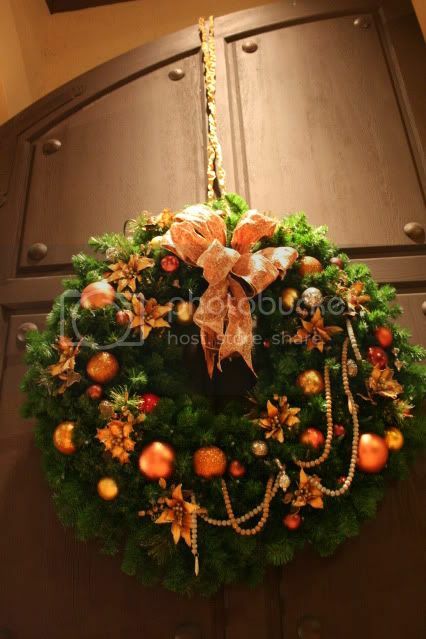 I especially loved the string of sparkly gold wound throughout the wreath! 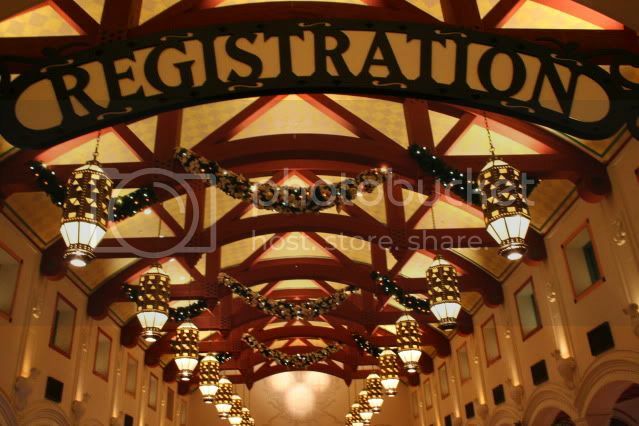 More sumptuous swags lining the registration hall! 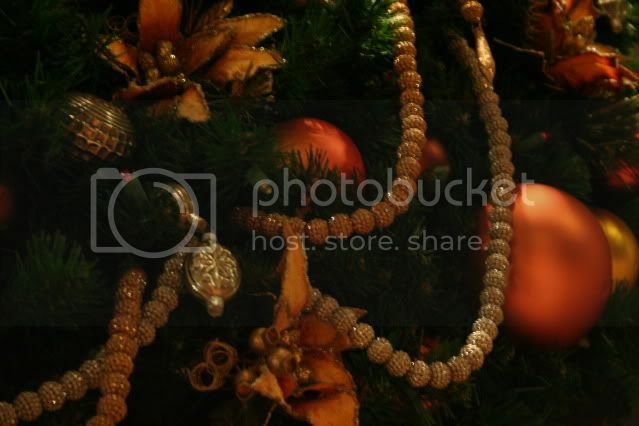 Take Christmas, dip it in Mayan Gold, and that's what I felt like I had stepped into! 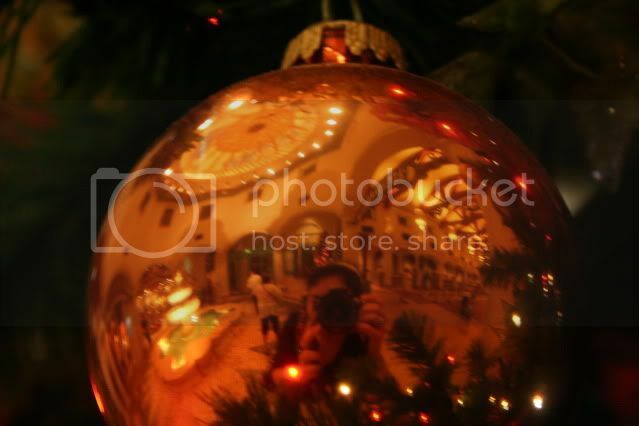 I love ornament reflection pictures! 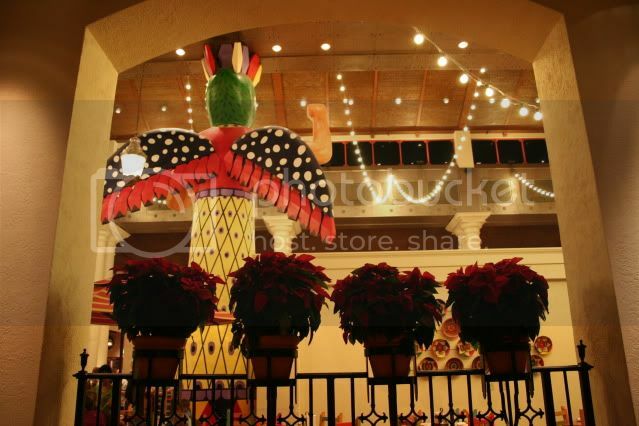 Fun Fact: Poinsettia flowers are native to Mexico. 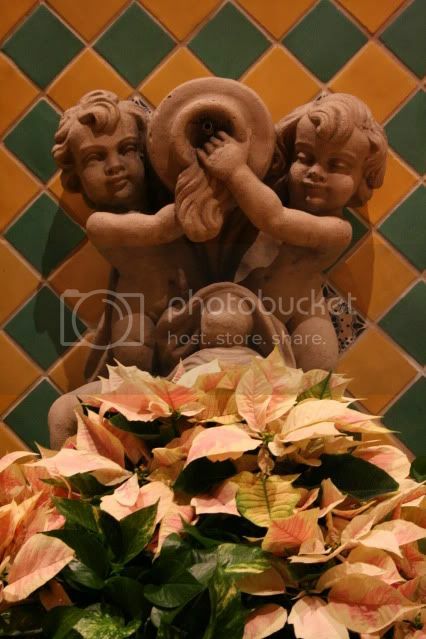 I only learned this just now while googling how to spell "poinsettia," but it makes so much more sense why they were all over the place at Coronado. Ancient Aztecs used them to make dye. Cool. 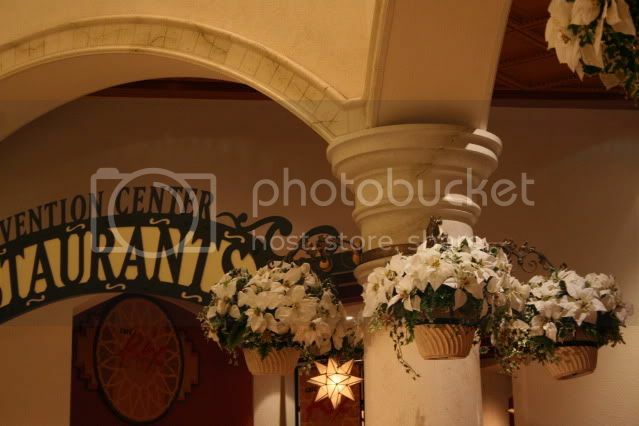 Every column in the entrance hall was flanked by four hanging baskets of poinsettias. 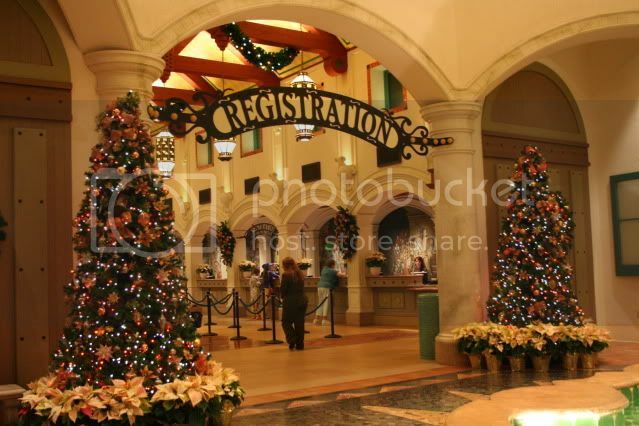 The first place I go to see the decorations: the lobby. 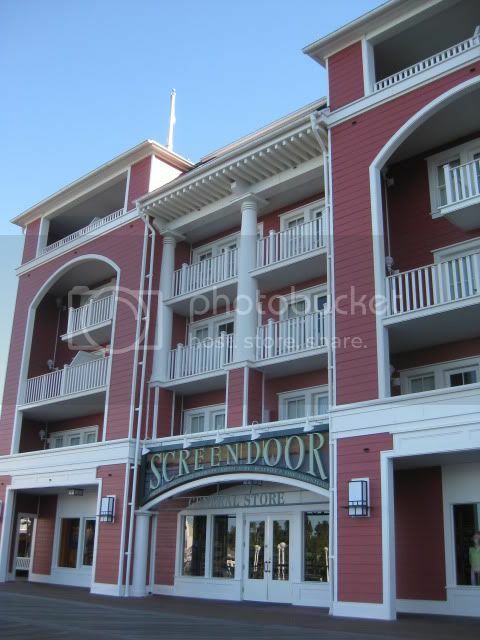 The second: the SHOPS! When I'm on the hunt for decorations, I inevitably notice little ordinary awesome details that I never noticed before. 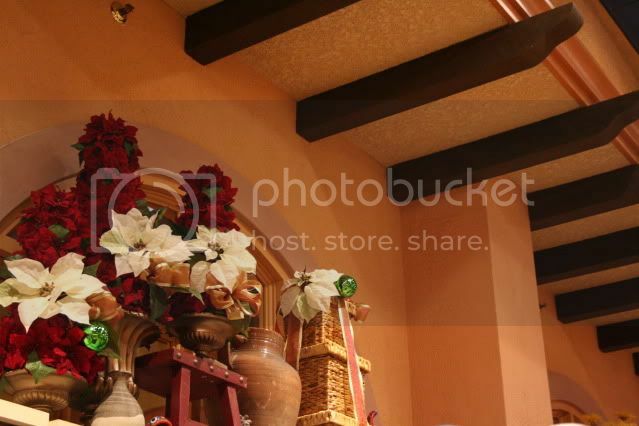 Love these exposed wooden beams in Jose's Shop! 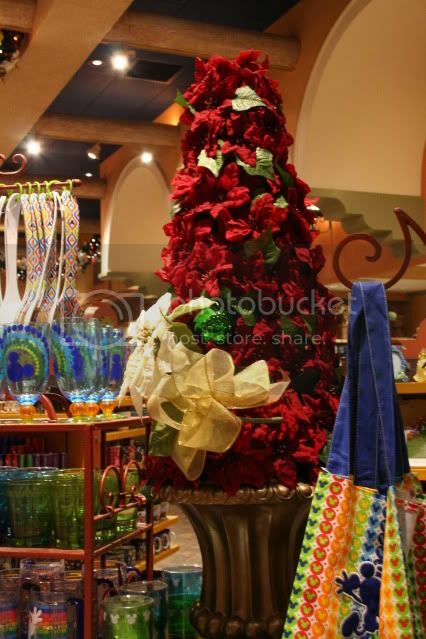 I want a tree made out of glowing ruby red poinsettias! 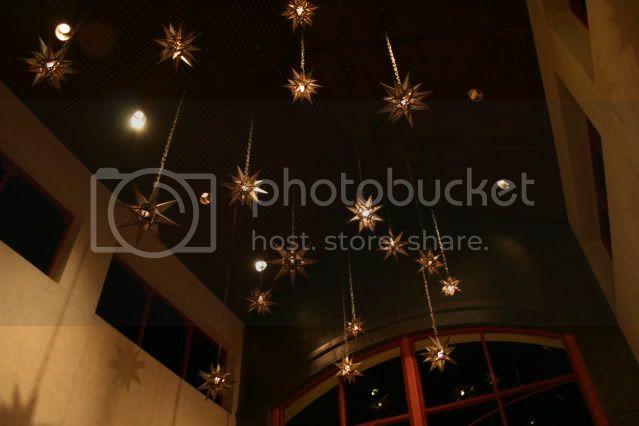 I think these stars already graced the Coronado ceiling before the holidays, but they sure looked good with all the decorations! 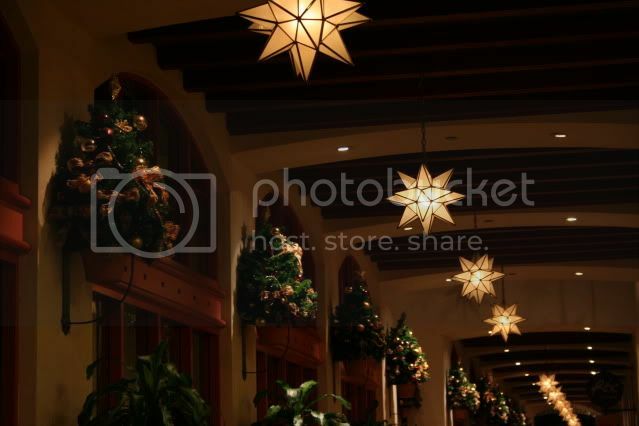 Along the hallway leading to Cafe Rix and the Pepper Market there was just a line of mini hanging Christmas trees. I wanted to take one home...it would be the perfect size for an American Girl doll...and pre-decorated too! 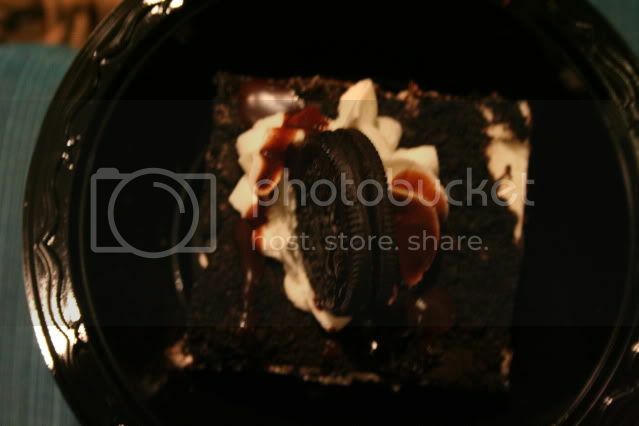 But don't worry, I grabbed my oreo cake and left before the temptation got too strong! 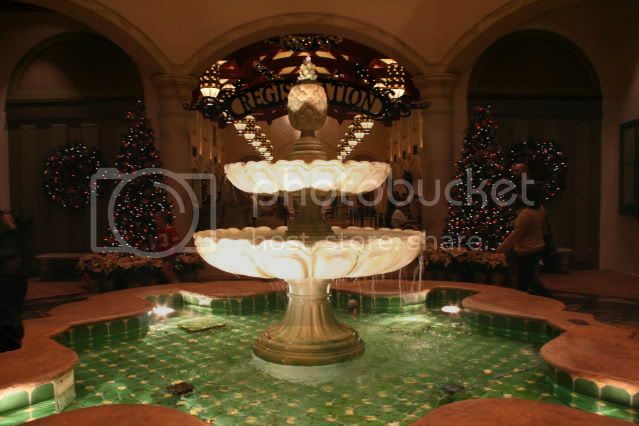 Any requests for resorts you'd like to see all decked out for the holidays?? 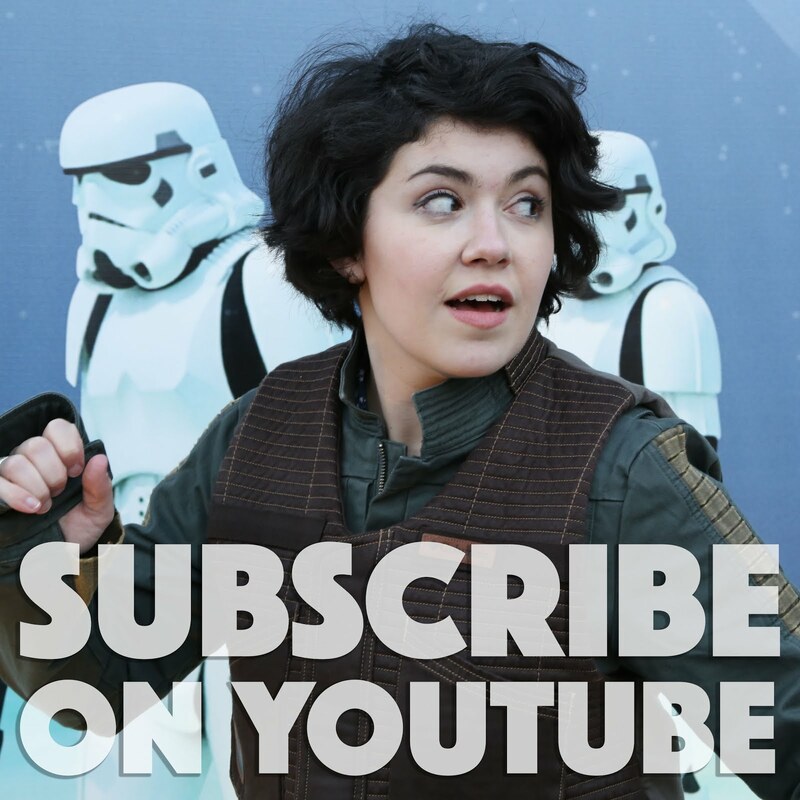 Leave a comment!! Well, it's Monday again! Sorry I didn't get any posts in last week, but I hope everyone had a lovely Thanksgiving!! ﻿I made a mini feast for my brother and I. I didn't want to get a whole big turkey we wouldn't be able to eat, so instead I got two little Cornish hens. They were so cute, and really tasty too! But it isn't Cornish Hen Monday...it's CUPCAKE MONDAY! 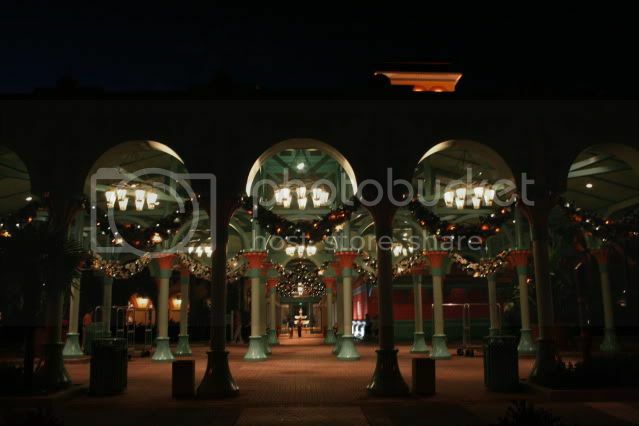 The other evening I was over at Coronado Springs, where all the Christmas decorations look like they've been dipped in Mayan gold! If you want to eat at the Pepper Market, you have to sit down, and there's an automatic gratuity added to your bill. 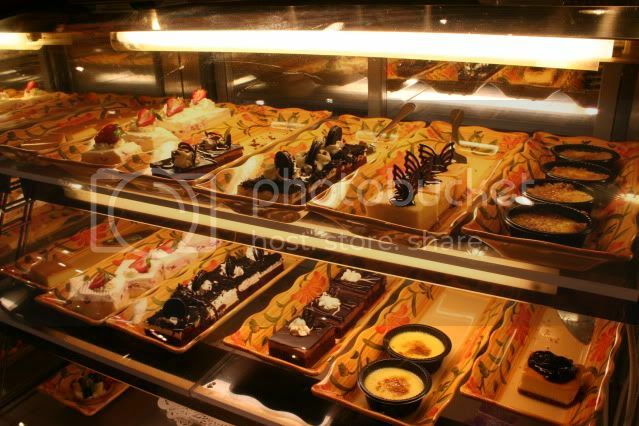 Luckily Coronado Springs has the same selection of desserts right down the way at their counter service/marketplace Cafe Rix. 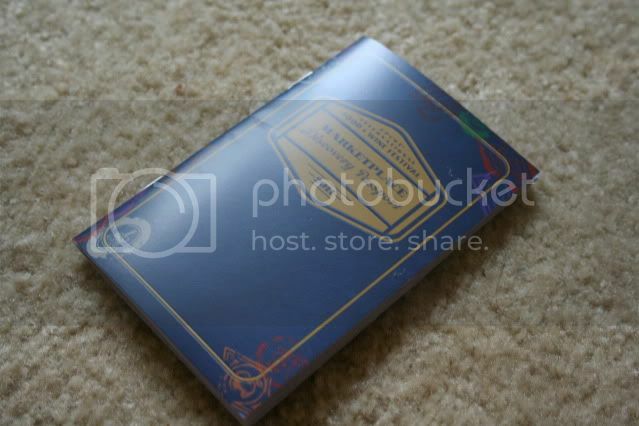 Random pic of the 2011 Disney World holiday paper cup! 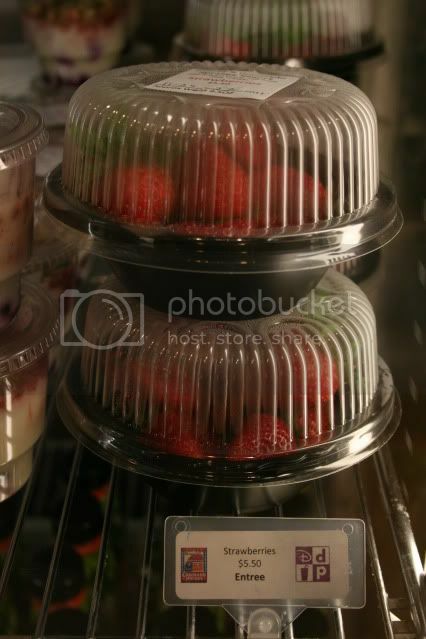 Did you know they sell big giant bowls of strawberries at Cafe Rix?? Looks delish. 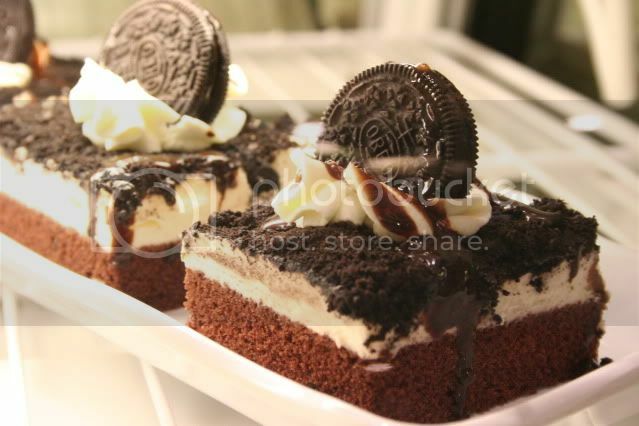 or OREO cake? I went with the last one! Yes, I realize this is more like a piece of cake rather than a cupcake, but Coronado doesn't have any cupcakes...so we can just pretend this is a square cupcake...maybe? yes? lol! It was really good. You know how some Oreo cakes just taste like chocolate cake and vanilla icing? This one reeaaally tasted JUST. like. an Oreo. And not only because of the cookie on top! 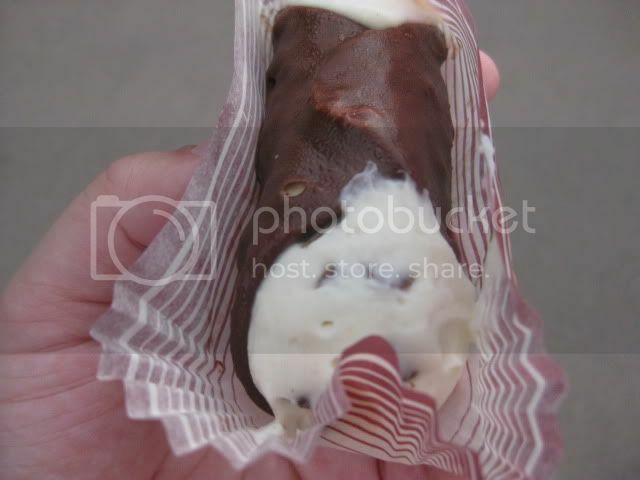 The icing was very nice and creamy. 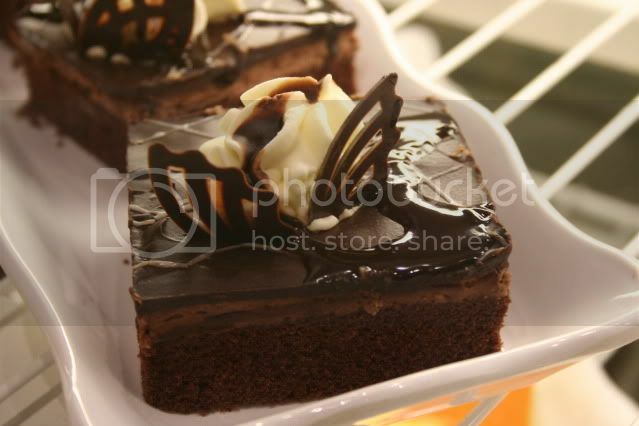 The chocolate cake had a tendency to be the slightest bit dry, but overall very nice. How about a little strawberry summer to brighten up your November Monday? 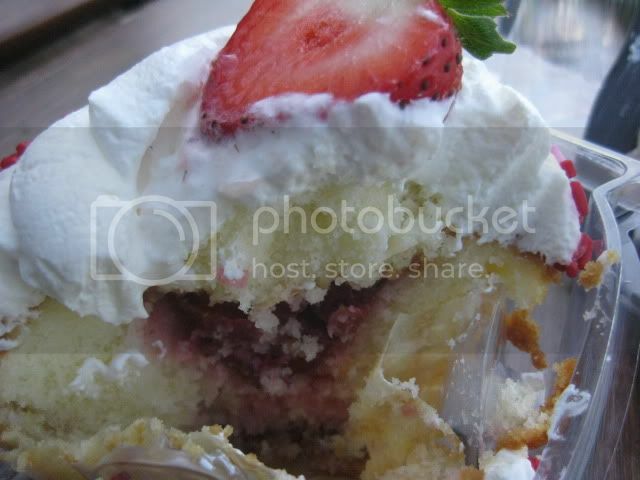 Today I've got a perfectly pink and adorable strawberry shortcake cupcake to share! 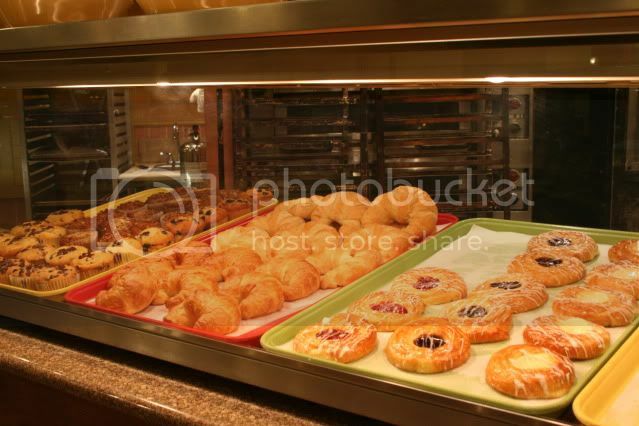 It's from...can you guess...that oh-so-lovely Boardwalk Bakery. lol - I know, reeeeal original (that's my sarcastic Internet voice, btw ). 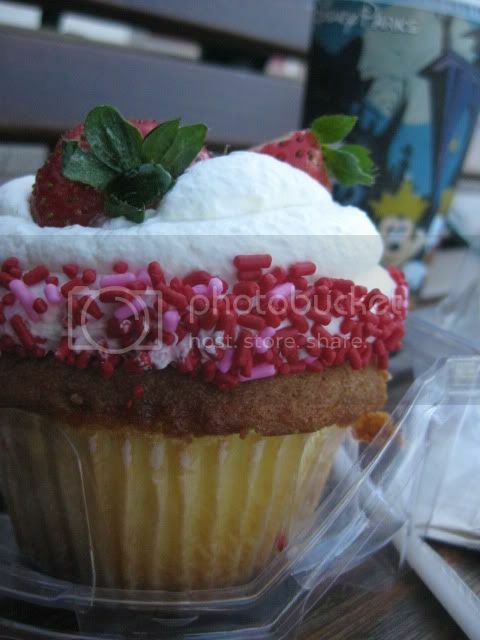 Sometimes I feel like half my cupcake Monday's are about the BB, but I can't help it -- they're so good! 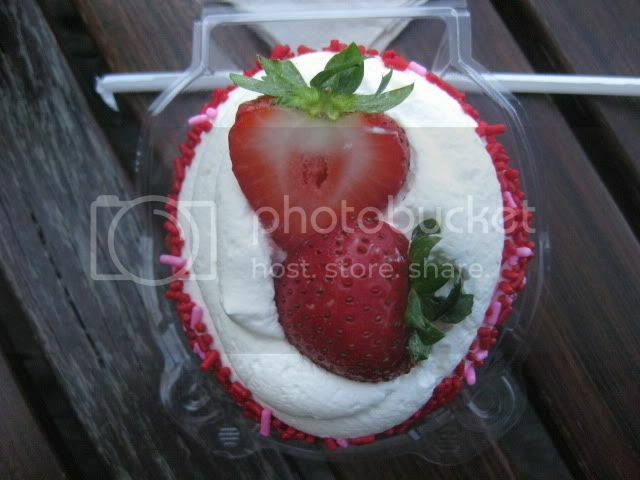 And besides, who could resist those sweet strawberries?? 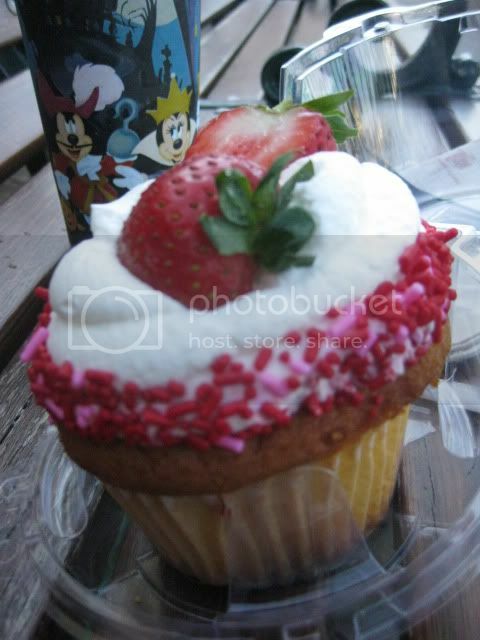 Half the reason I love this cupcake is because of how adorable it is -- the garnish and the little red and pink strawberries. 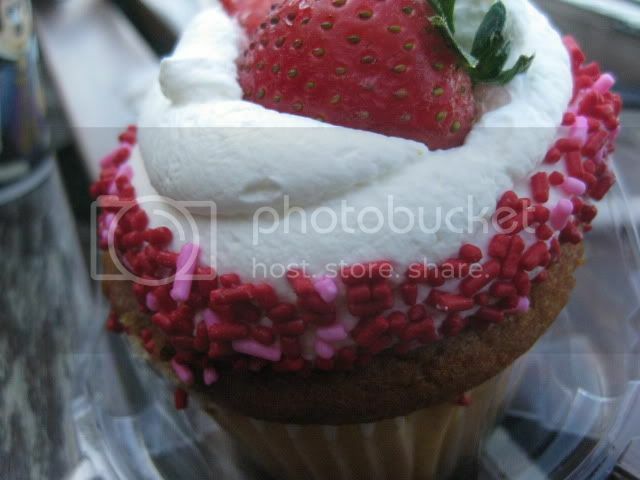 It's like valentine's day in cupcake form. 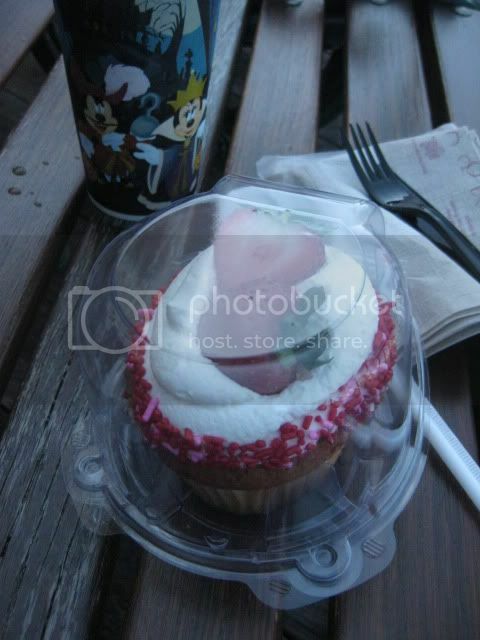 I actually tried this cupcake a few weeks ago -- the Halloween cup in the background gives me away! 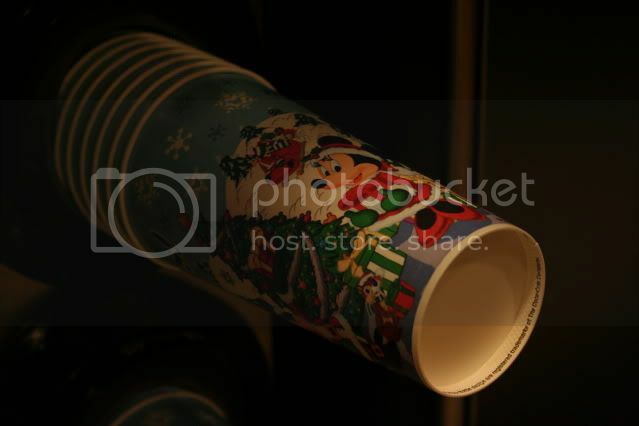 Now the cups have Christmas designs on them! The cake itself was a lovely light vanilla. 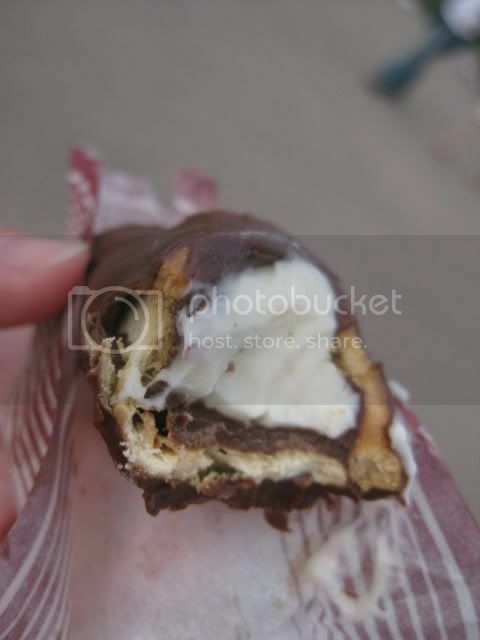 The only thing I didn't love was the filling. 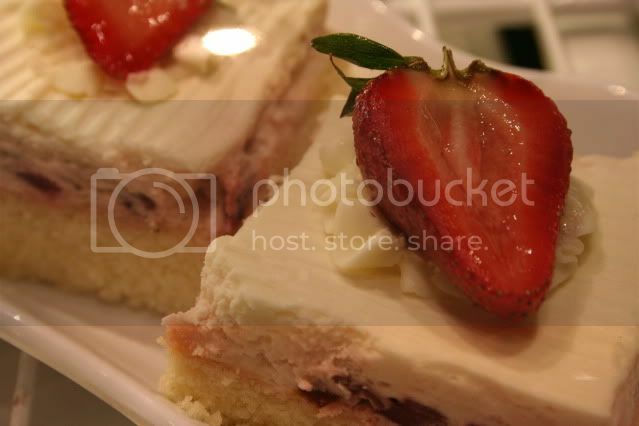 Usually the filling is really good, but this one had chunks of strawberry that I wasn't a huge fan of. 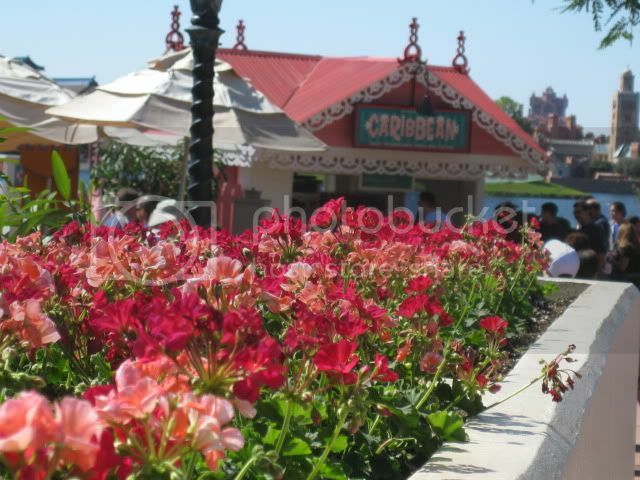 And a Cupcake Monday post isn't complete without a few atmosphere pics! Just imagine: it's sunny and the sky is oh-so-blue. 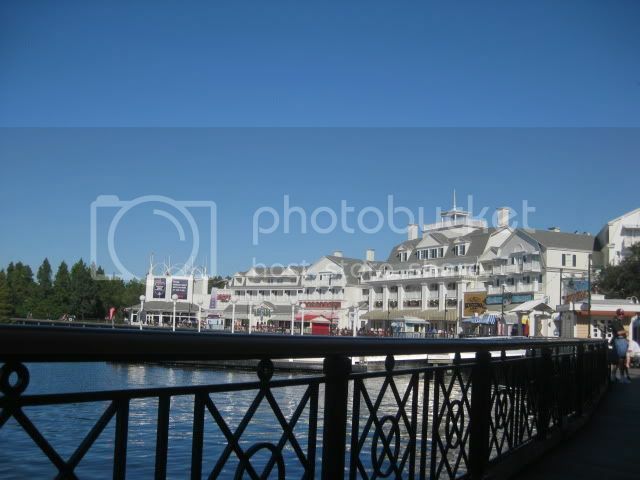 You're sitting on a bench watching the friendships tool along peacefully to and fro in crescent lake. 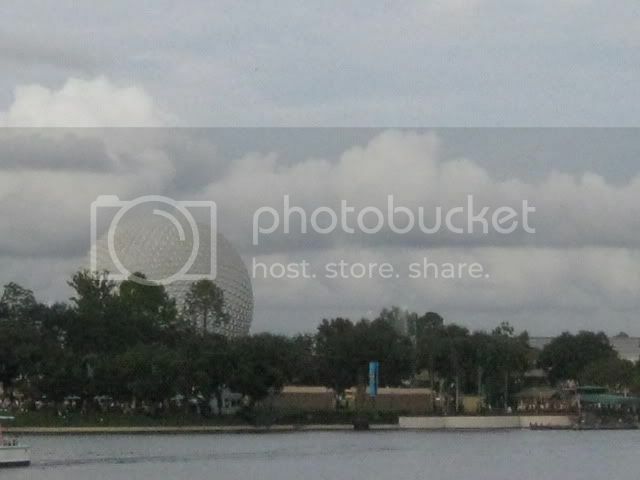 Behind you the Boardwalk Resort rises up in red and white and yellow, not too unlike your yummy cupcake! 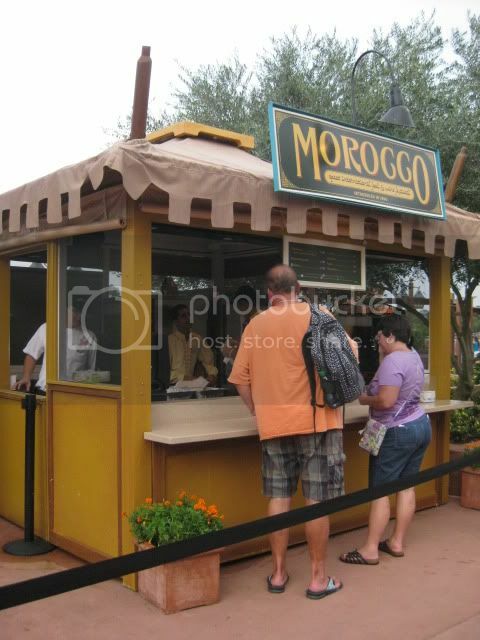 The Food & Wine Festival at Epcot may be over now, but I never got to finish posting about the tasty treats I tried there! 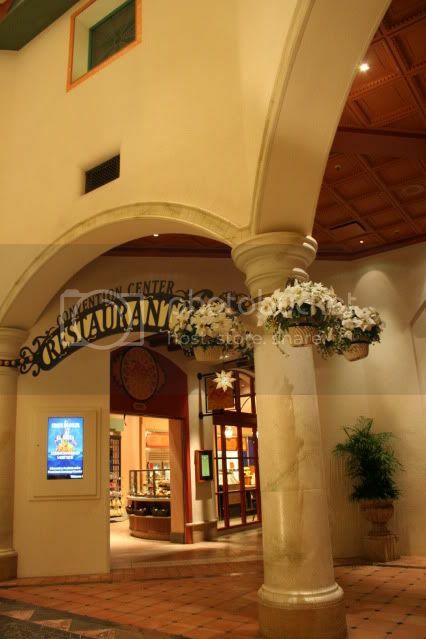 So I hope you all have a good lunch today, because, without further ado, here we go on a little culinary tour of World Showcase! 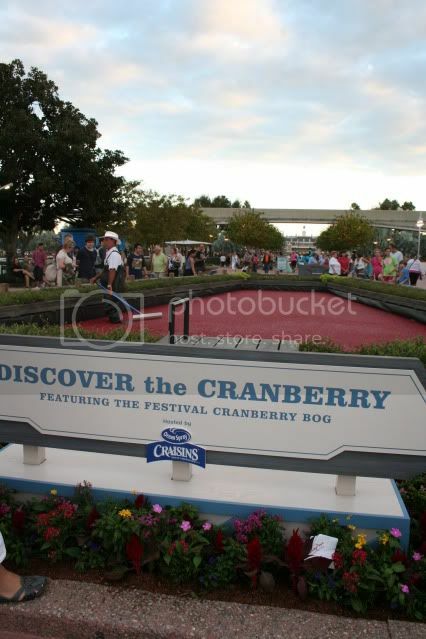 They put a cranberry bog in Epcot for Food and Wine. That's just awesome. 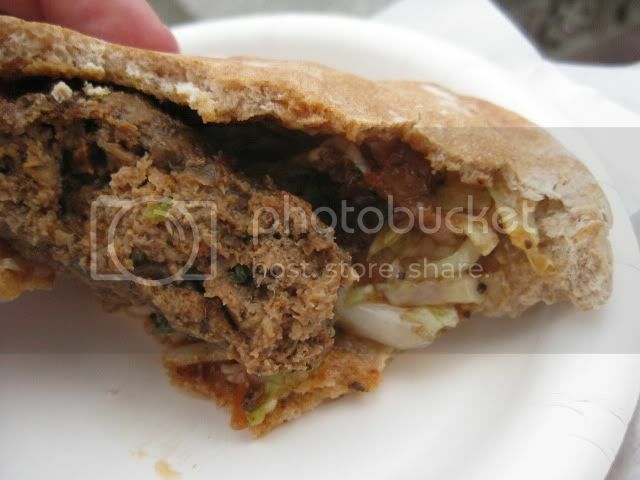 How about a kefta pocket...ground seasoned beef and veg in pita bread. Yum yum. 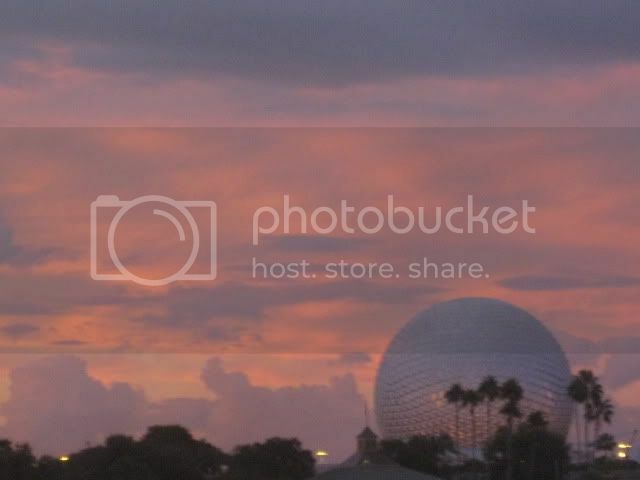 I love how the Epcot ball blends so seamlessly with the sky some days! 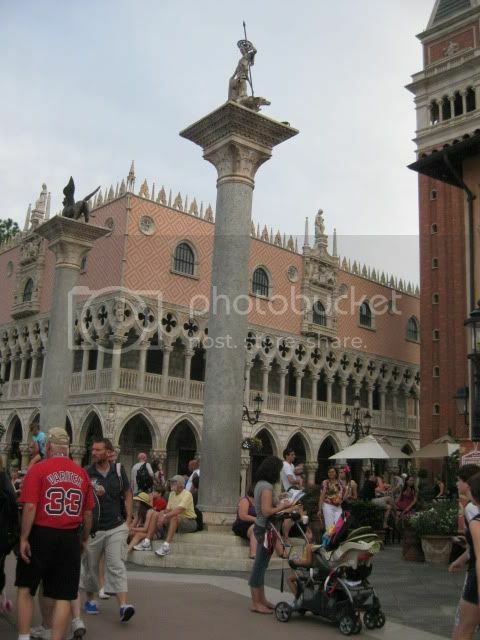 Next we'll breeze on over to the Mediterranean for a taste of Italia! Here's a funny story: at every booth, you would pay at the cash register, then take your receipt to the window, where a CM would take it and get your order. In Italy the CM taking the receipts was just so Italian. He'd hand you your ravioli or canoli with a flourish and say "Prego! Prego!" He said "prego!" to every single customer. Love it. This was the Ravioli di Formaggio all'Emiliana...baked cheese ravioli with creamy beef bolognese, parmesan, and mozzarella. It was tasty...nothing stellar, but good. 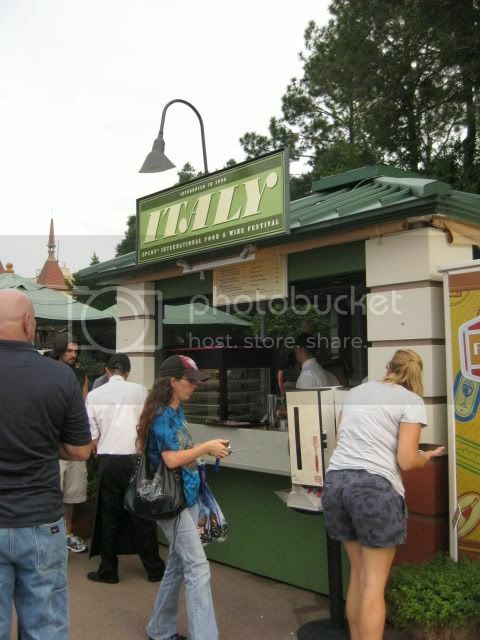 The Italy booth also had a pasta with shrimp which I think must not have gotten ordered much...when someone did order it, Signor Prego and the other CM's cheered! Yes. 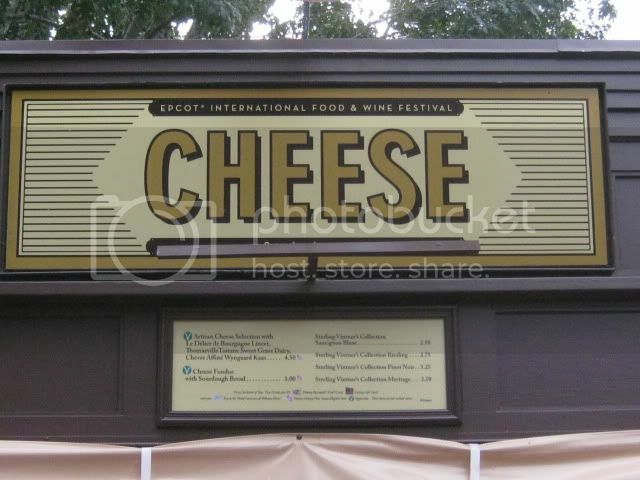 There is a booth that is just called CHEESE. 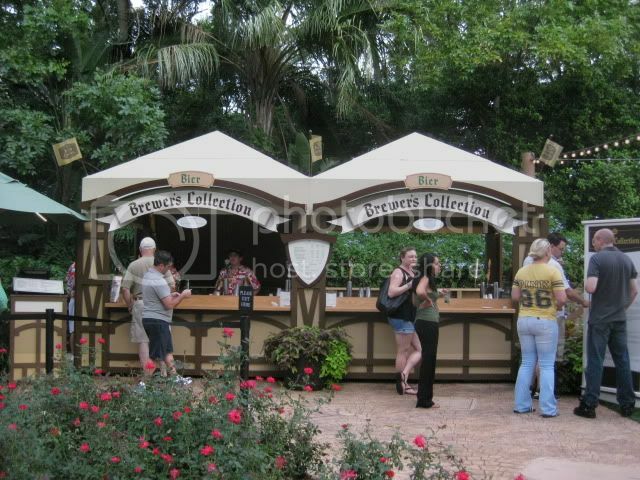 The Brewer's Collection booth. 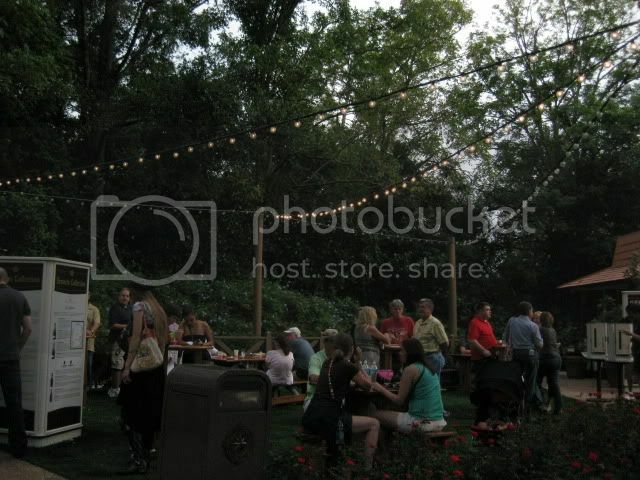 lol...for me it was more of a FOOD festival than Food and Wine. I'm just not a huge fan of alcohol...and anyway, I usually went by myself after work - it's no fun to drink by yourself. 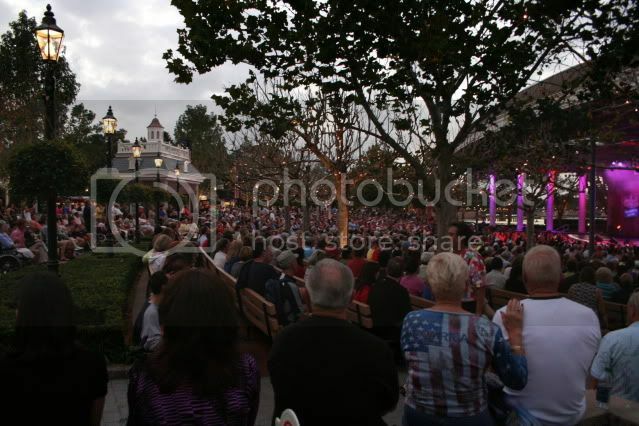 I always loved stopping by to see what the "Eat to the Beat" concert was that night. 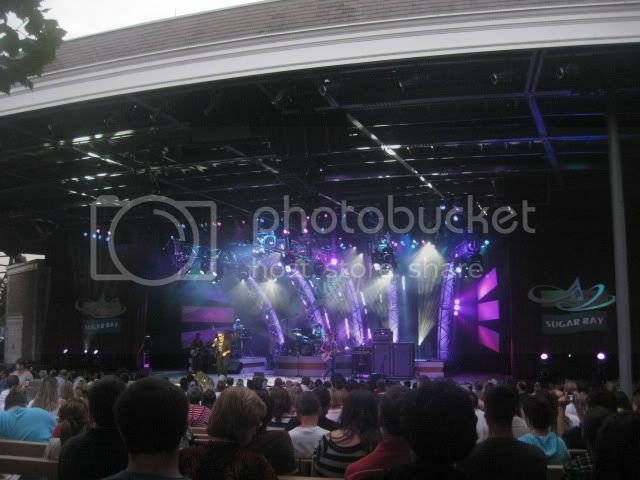 One time I caught Sugar Ray...they were really good! It was cute to see some groups of young adults in the audience standing up and singing along. This guy, the lead singer, often came off the stage and walked through the audience, pausing to take pictures with fans -- all while continuing to sing the song, lol! 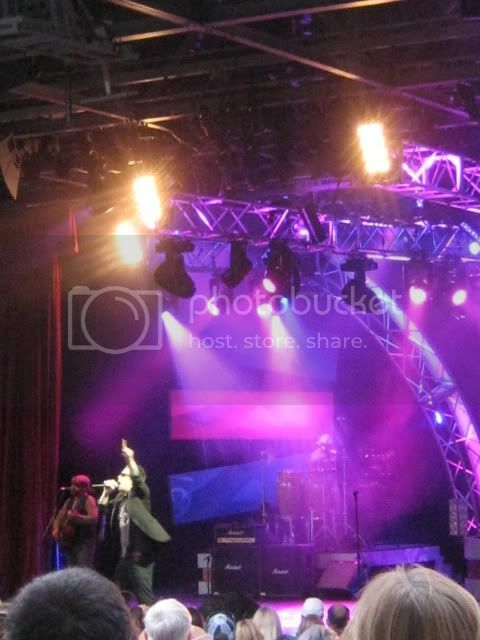 Sugar Ray was good, but the best act I saw was the Pointer Sisters. The theatre was absolutely PACKED for them! Most nights I could find a seat, but not with them playing. Oh well, I stood along the side and clapped along anyway. They did "I'm So Excited" and "Jump." They were fantastic! 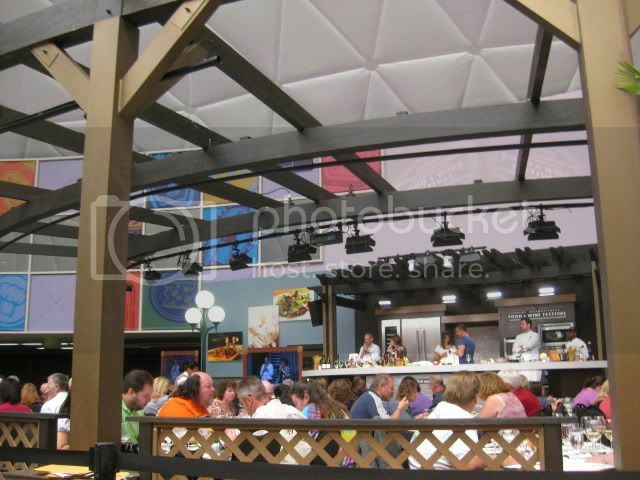 Another celebrity sighting I had was in the Food and Wine Festival Center, set up back in Future World. 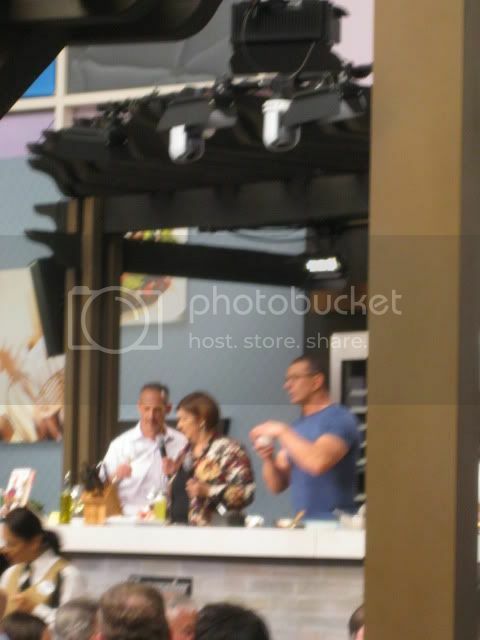 It was Robert Irvine, the guy from Dinner Impossible and Restaurant Impossible! Obvi you had to have a ticket to actually be sitting at a table and tasting the food. 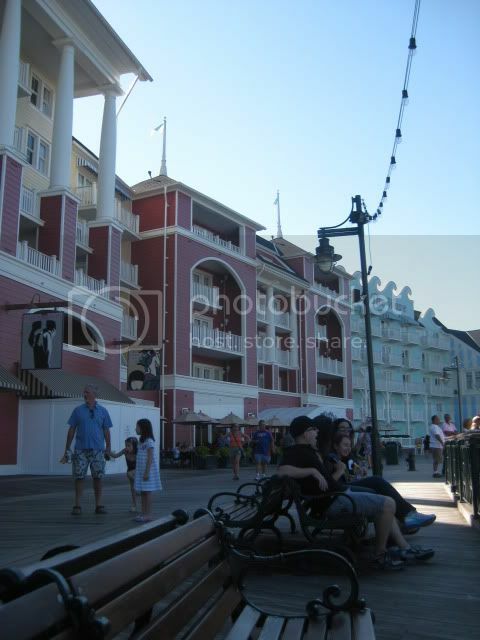 But I sat on a nearby bench watching from the outside for a bit, it was fun! 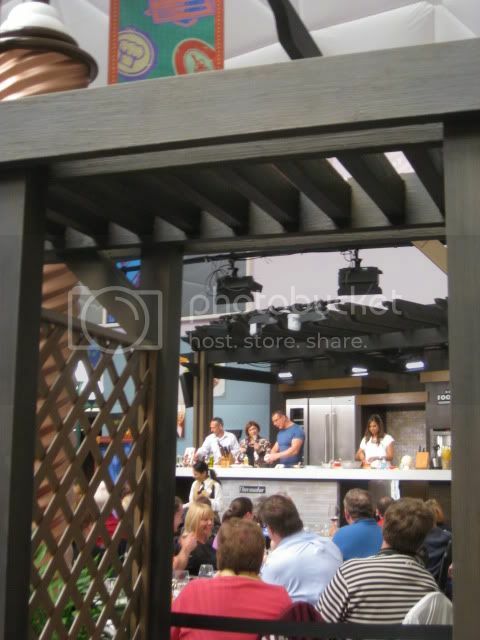 The designer girl from Restaurant Impossible was there too. My brothers and dad and I like to watch Food Network, so I texted them to tell them I was watching Robert Irvine make a banana bread pudding! 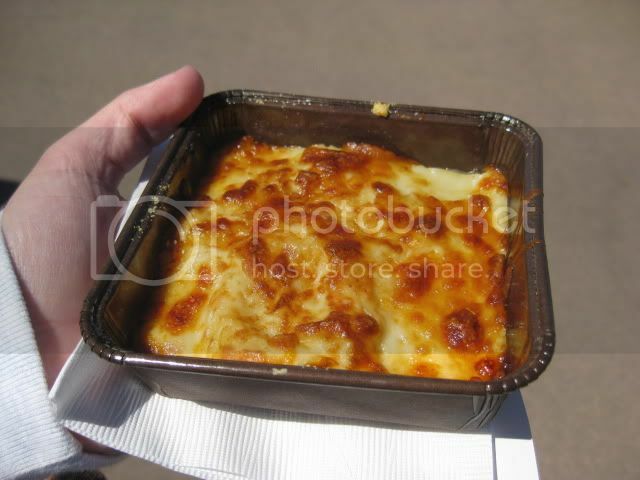 My younger brother Athos said I should get him a signed banana bread pudding and bring it back, lol. Sorry, Athos! 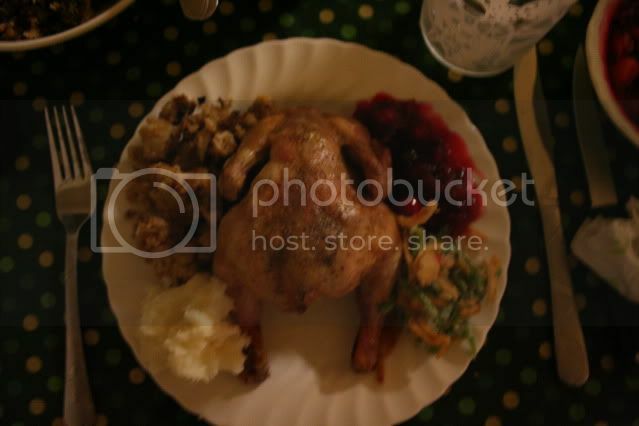 Alright, just a few more food pics. 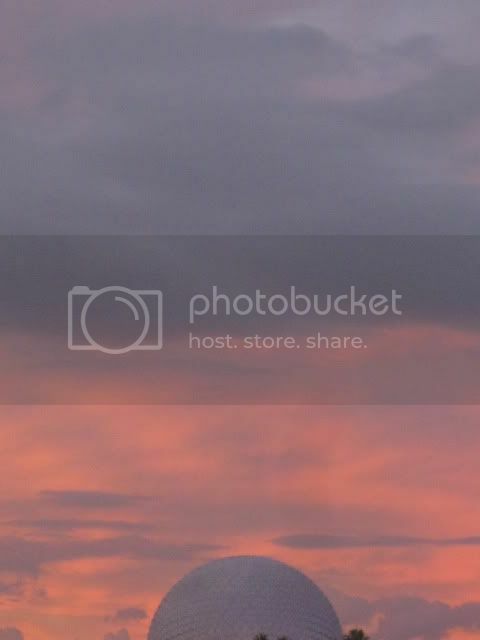 As you have probably deduced by now, these pics are NOT all from the same day. 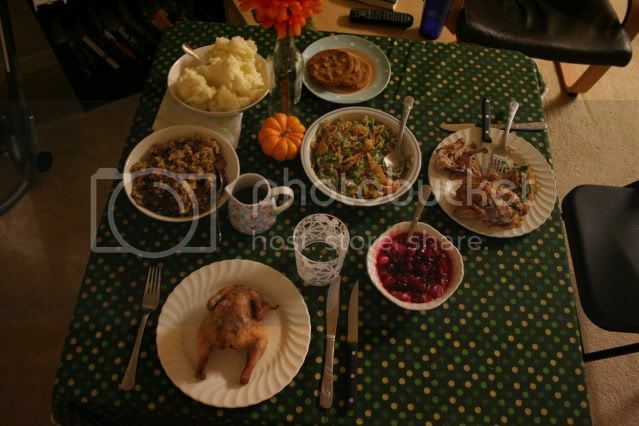 I couldn't eat that much in one evening, lol! 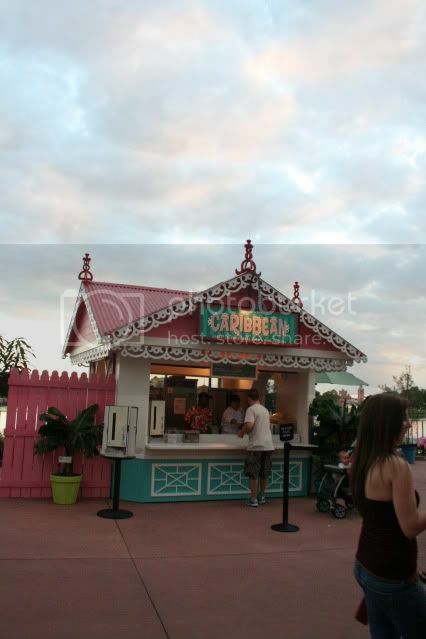 My vote for the cutest booth goes to the Caribbean with its pink and white and teal! 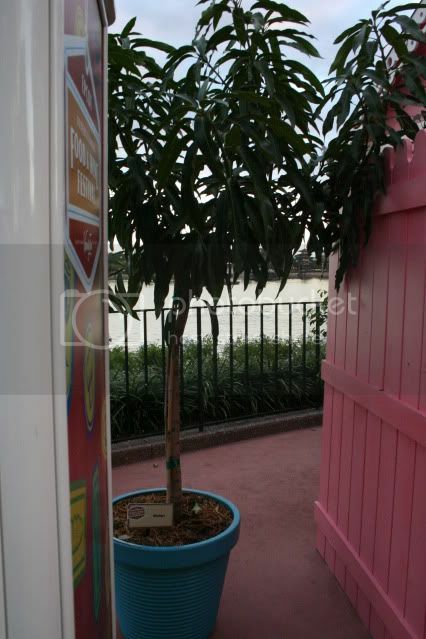 The Caribbean booth even had a mango tree next to it. I want a mango tree. How cool would that be? Of course then I had to try something with mango! 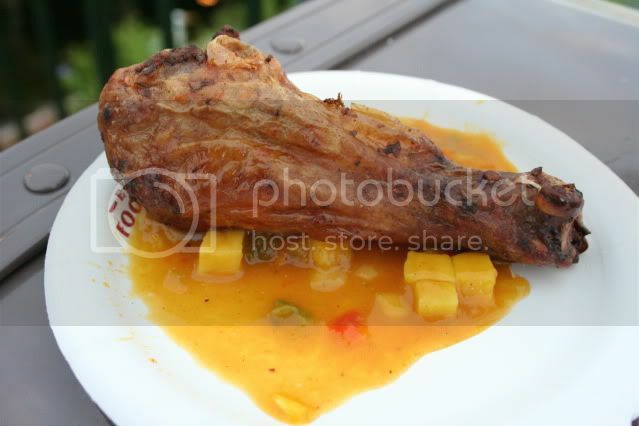 This was the Jerk Spiced Chicken Drumstick with Mango Salsa. It was SUPER good, plenty of meat on the chicken, a little kick to the fruity flavors of the mango salsa. 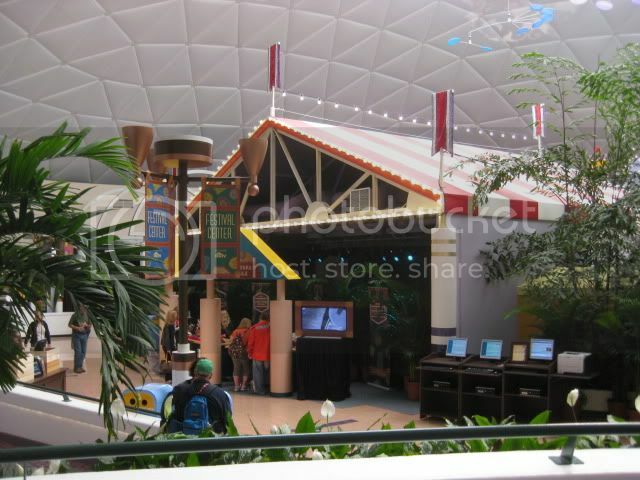 The Greece booth was also incredibly cute...it was white and domed, just like on a postcard. 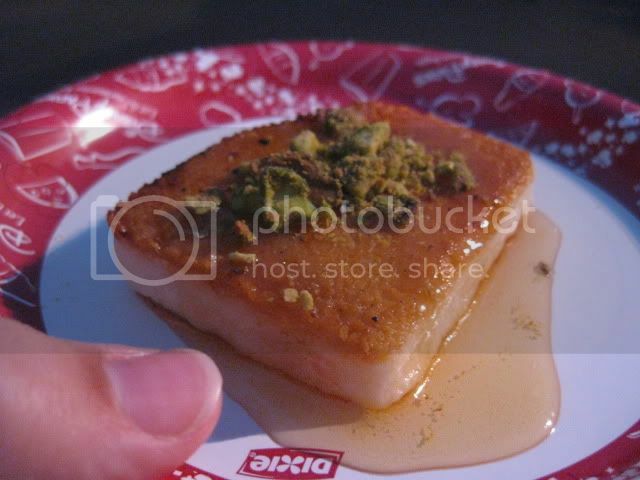 Somehow I never got a pic of it, but I did stop by to try the Griddled Greek Cheese with Pistachios and Honey. It sounded so good...but sadly it was rather a disappointment. The cheese was rubbery and cold -- I didn't even finish it it was so bad. I just ate the pistachios off the top, lol. 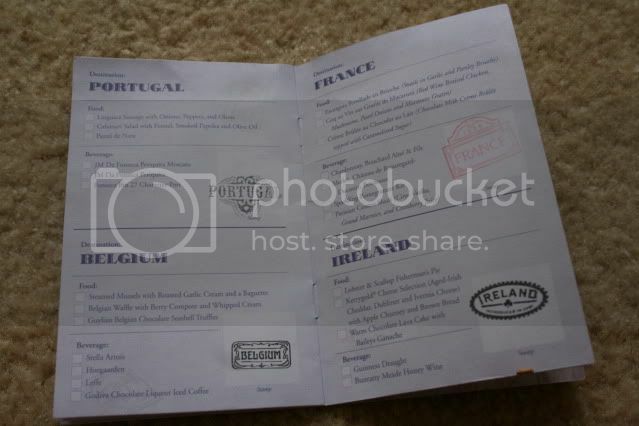 You would go around to every booth and get your passport stamped! I did not try something from every booth, but luckily they were really nice about giving the stamp even if you didn't buy anything! 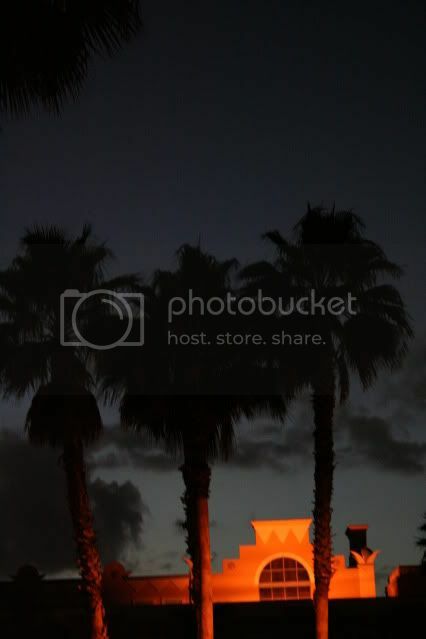 One of the nicest things about the Food and Wine Festival is just having an excuse to stroll along on an evening like this. 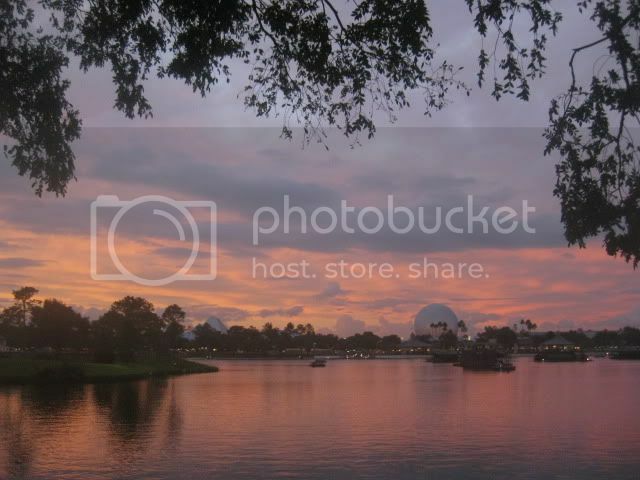 Spaceship Earth looked like a bubble from the pink-and-purple sunset sky that had come to rest on the ground. But it seemed it might float off again at any moment, it so perfectly reflected the sky's colors! 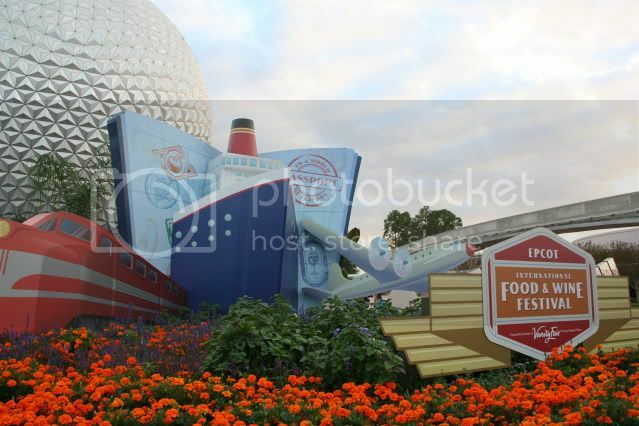 So in review: I really enjoyed getting to experience the Food & Wine Festival this year. 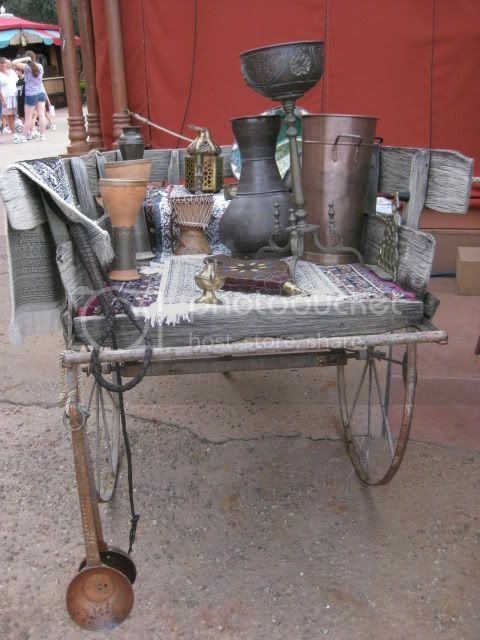 I have been in Epcot when it was going on in the past, but we never really stopped to try anything because with my big family, if we bought one small thing, we'd have to buy seven of them to get one for everybody! 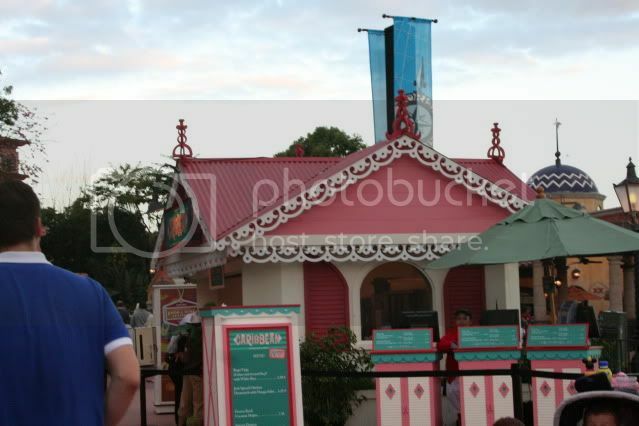 There were some really good things at Food & Wine...the Coq au Vin from France, the Caribbean Chicken Drumstick, the Ginger Ice Cream at China. But there were also a lot of just ordinary offerings -- and considering how small some of the portions are, it is pretty overpriced. 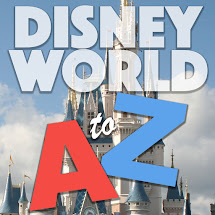 Would I plan a trip around Food & Wine? No. 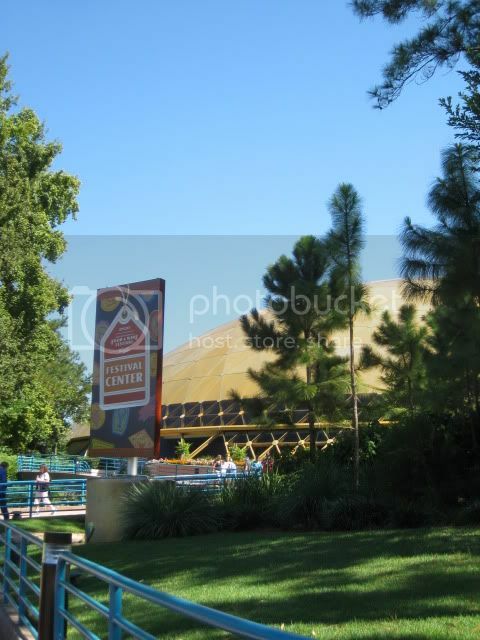 But I would still enjoy stopping by if I happened to be at Disney World in October!